Experience the natural beauty of Canada where spectacular scenery appears at every bend. Rolling ranch and turns to mountain peaks and wild canyons change to brilliant ocean shorelines. You will enjoy centuries-old glaciers and soak in the spray of thundering Niagara Falls. If you are lucky you may spot bear and moose in Ontario, Bighorn sheep in Alberta and whales in British Columbia. Watch as limitless vistas are transformed into quaint, cobbled town squares or cosmopolitan cities like Toronto and Montreal. Relive the past in North America’s only fortified town, frontier trading posts and colonial ports on the Pacific. A three thousand mile journey in which wonders never cease. Arrive at Pearson International Airport, Toronto. Individual transfer to your centrally-located hotel. After a check-in with your tour director, the remainder of the day is free. Overnight in Toronto. We get better acquainted with our travelling companions at breakfast before exploring Toronto on a morning city tour. Experience the sights and sounds of this cosmopolitan city as you explore the downtown area and residential areas. Highlights include the Eaton Centre, old and new City Halls, Casa Loma, Yorkville and the University of Toronto. You will pass by the Rogers Centre (formerly SkyDome) and the CN Tower and drive along the harbourfront for a complete impression of this city. The remainder of the day is free for independent exploration. Overnight in Toronto. Continental breakfast included. Departing early, we enjoy a pleasant drive east. Following the north shore of Lake Ontario, we pass endless miles of rolling farmland. Our first destination is the beautiful Thousand Islands resort region, where we embark upon a relaxing cruise. After taking in the sights and sounds of this river playground, we re-board our tour coach for the drive to Montreal. Overnight in Montreal. Continental breakfast included. This morning, we will tour the second-largest French-speaking city in the world. The dynamic city of Montreal encapsulates the two founding cultures of Canada and boasts a curious blend of history and modernity. Touring the downtown area we view the Olympic Complex, charming Old Montreal, McGill University, the residential streets of Mount Royal and the bustling shopping streets. The afternoon is at leisure. This evening, perhaps embark on an optional dining excursion and experience ‘Montreal by Night’ – a scenic trip out on the town to one of the city’s best known Greek restaurants. Overnight in Montreal. Continental breakfast included. The day is at your leisure to further explore the sights of this charming World Heritage Site. You can enjoy an optional full day excursion to Tadoussac including 3-hours of whale watching on the St. Lawrence River at the mouth of the Saguenay River. Step aboard a regular boat and go in search of the world’s largest mammals. You will also visit the spectacular Montmorency Falls that are 30 metres higher than the world-famous Niagara Falls. The rest of the day is at your leisure to explore this historic French-Canadian city with narrow streets and unique boutiques. Overnight in Quebec City. Full breakfast included. 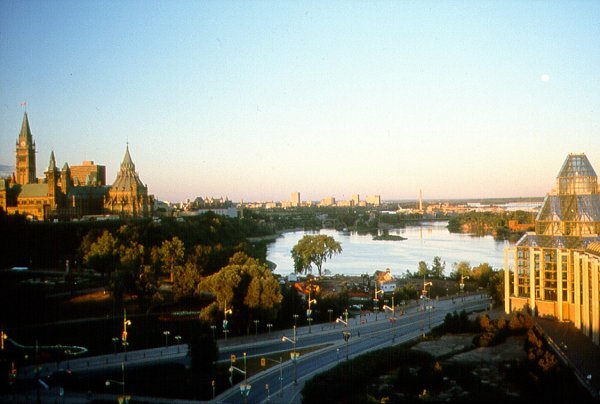 Our journey west from Ottawa features sparkling lakes, rushing streams, deep forests and characteristic northern towns. The trip will be highlighted by a visit to Algonquin Provincial Park where we will take a walk along the scenic trails. This immense wildlife and forest preserve is a favourite destination for camping expeditions during the summer months. Thereafter, we enjoy the beauty of the Muskoka region as we pass through on our way to Midland. Overnight in Midland. Continental breakfast included. Our drive today follows the scenic Niagara Parkway through the historic village of Niagara-on-the-Lake, home of the Shaw Festival. Here we see a small but thriving community, proud to display a carefully preserved nineteenth-century atmosphere. This afternoon completes the last segment of the tour’s eastern portion with a short drive back to Toronto. The evening features a special “Farewell to Eastern Canada” dinner at the CN Tower. Overnight in Toronto. Full breakfast and dinner included. Today we transfer to Pearson International Airport in Toronto and check in for our flight to Calgary, Alberta. Having crossed two thousand kilometres of Canadian wilderness and western wheatland, we arrive at Calgary International Airport and transfer to our hotel. Overnight in Calgary. Continental breakfast included. Today we will enjoy a tour of the region around Banff. The area became Canada’s first national park in 1885 to protect its natural hot springs. An optional Helicopter Sightseeing Tour will give you the chance to see the eastern ranges of the Rocky Mountains. 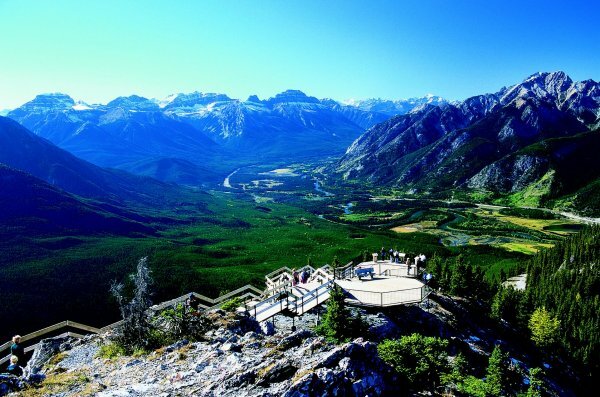 You may also take part in a gondola ride to spectacular Sulphur Mountain. Bring your camera! The rest of the day is at leisure to explore the surroundings of Banff, stroll along Banff Avenue, or relax and enjoy the scenery.Overnight in Banff. Full breakfast included. 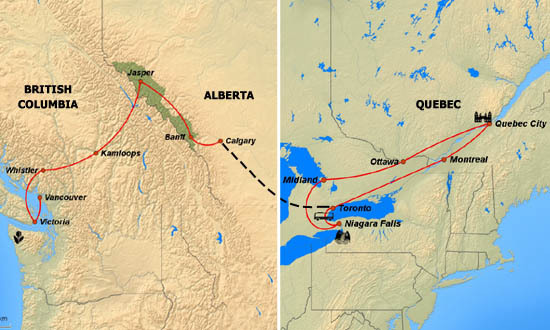 Today’s journey through Banff and Jasper National Parks promises to be a highlight of our Canadiana programme. Shortly after leaving Banff we visit the famous scenery of Lake Louise, one of the most photographed lakes in Canada. Afterwards, we travel north on the famed Icefields Parkway through a rugged wilderness flanked by dramatic mountain ranges. At the Columbia Icefield we board a specially constructed Ice Explorer to ride on the surface of the ancient Athabasca Glacier. Close to Jasper, you have the chance to go on an optional raft trip on the Athabasca River. Your experienced guide will point out the natural and human history as you raft through short rapids and stretches of calm waters. Overnight in Jasper. Full breakfast included. Before leaving Jasper National Park this morning, you can take part in an optional Spirit Island Cruise on Maligne Lake, the most picturesque and largest glacier- fed lake in the park. You may alternately take an optional motorcycle tour of Jasper, riding in the comfortable sidecar with an unmatched view of the forests and mountains. Then, we travel west along the Yellowhead Highway and into the heartland of British Columbia. Breathtaking, unspoiled vistas await visitors in every season of the year. The route takes us along the Thompson River through the picturesque Shuswap Highlands. Overnight in Sun Peaks. Full breakfast included. We can expect a day of dramatic scenery changes when we drive through the ranch lands and head for the coastal mountains. A journey along the Duffey Lake Road exposes new vistas at every turn. An optional Floatplane Sightseeing Tour over Garibaldi Park gives you an inspiring view of a natural preserve of volcanic peaks, alpine lakes and meadows. The flight concludes with a perfect view of the ski terrains and streets and squares of Whistler village. Enjoy the rest of the day at leisure. Overnight in Whistler. Full breakfast included. The Sea-to-Sky Highway leads us south through spectacular coastal scenery today. From Horseshoe Bay, we cruise by ferry across the Strait of Georgia to Vancouver Island and continue by coach to Victoria, British Columbia\'s capital city. 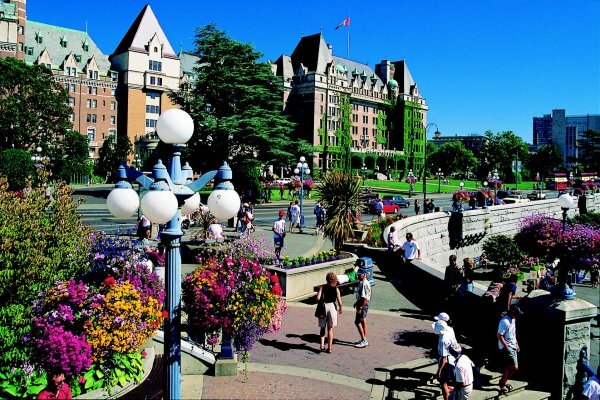 Arriving in Victoria, we embark on a city tour of this former British enclave. Overnight in Victoria. Full breakfast included. Proud of her maritime heritage, Victoria has retained a quaint, colonial demeanour evident in the many 19th century landmarks throughout the city. Today we treat ourselves to a tour of the beautiful floral displays of the world famous Butchart Gardens. You can take part in an optional Floatplane Sightseeing Tour over downtown Victoria and the Strait of Juan de Fuca with the Olympic Mountains in the distance. You can also go on an optional Whalewatching Excursion aboard a Zodiac or a regular vessel. Watch for the magnificent orcas and the abundance of marine wildlife. The remainder of the day is at leisure to explore the city’s delights. Overnight in Victoria. Continental breakfast included. Today we continue on our way via a pleasant cruise through the resort region of the Gulf Islands to the oceanside city of Vancouver. Upon arrival in Vancouver, we enjoy an interesting tour of the city, including Stanley Park, English Bay, Gastown, Chinatown, and much more. The remainder of the day is free for independent exploration or simple relaxation. This evening features our \"farewell\" dinner party at the Capilano Suspension Bridge with a welcome from First Nations carvers. Overnight in Vancouver. Continental breakfast and dinner included. A time for last-minute shopping and sad farewells. Individual transfer to Vancouver International Airport in time to check in for your return flight. Continental breakfast included.